How to use my home for filming and how much to charge for my property to be used in a film or movie? We get these questions from owners daily and is the purpose of this tip sheet when negotiating with a production company to host their filming project. Every production creates a budget breaking done what each component will cost for their project. This includes crew costs, actors, and locations. There are no set fees, how much to charge and what you can expect when negotiating with prosuction is based upon this budget set aside for locations. You as the owner can consider the following when hosting production. First how unique or perfect for the project is your property. Rates can start at 1000.00 for the day to thousands depending on the budget and what the location is used for. Using your house for filming locations really depends on a number of factors. Some location scouts use a formula based upon home your business mortgage payments. But there is really no hard and fast rule as to how much to charge to rent your home or business as a filming location. 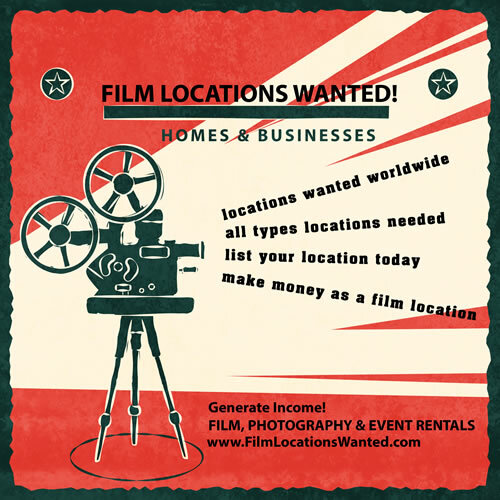 Items to consider when negotating a price to use your house or business as a filming location. Price for prep day. The day or days before a production begin require prep time. Meaning that production crew, set dresser and so forth need to get to the location earlier to set up the scenes to be shot. This is called prep and depending on how long or what needs to be done, a fee can be negotiated just for the prep. Same goes for wrap days, where clean up and tear down need to occur. This too is a fee you need to consider and negotiate with production. How many days do they need to use the property? How many people (cast and crew) are going to be on the property? Are they including your furniture and or props? Are they going to use your electricity? Disruption of your home for scene set up. Will they be shooting interior or exterior of property or both? Will they need a staging area for cast and crew? (a place for cast and crew to relax and wait until they are called on set. Staging area can also include a place for makeup, wardrobe and even the bathroom. Determine if they use the interior, the rooms that will be needed. Cleanup is important consideration as well. Get with the location scout and determine who will clean up the property. Some production have crew for cleanup, others will include a price for you to cleanup or to hire a cleaning crew to come in after the shoot is wrapped. Does the production company provide an insurance waiver? Will the production company have a location rental agreement? All agreements are generally supplied by the production company and typically include the location rental agreement detailing start to finish needs to use your property. Additionally, an insurance waver will be issued by the production company as well as any filming permits needed for production in your area. When in negotiation, be sure to ask them about the agreement and insurance waiver. To help determine a value of your property when negotiating, it is best to base the price upon what is it worth to you once all needs are are determined by the production company. If your property is within the budget and fits the criteria the location scouts and managers are seeking; and you feel value of turning over your venue for use is satisfactory, then a price can be struck. 1- A small production company wants to come in and shoot 3 days in your abandoned building with 3 crew members and a host. The production company can pay $1000.00 a day. So consider the factors we have mentioned and others that come up to target a price you will accept should your property be selected. 2- A large production company wants to use your property and they need ample parking for their equipment and the cast trailers. There will be over 20 people on set each day. They have their own generators and are self sufficient. Again you need to consider the budget of the production company and your value. The production company can pay you 5000.00 and more a day. When working with production, it is important to get all the details before settling on a rate to use your home or business as a location. Once everything is ready, sit back and have fun experiencing the magic of the filming process. Meet new people and perhaps even get in on the production as an extra.